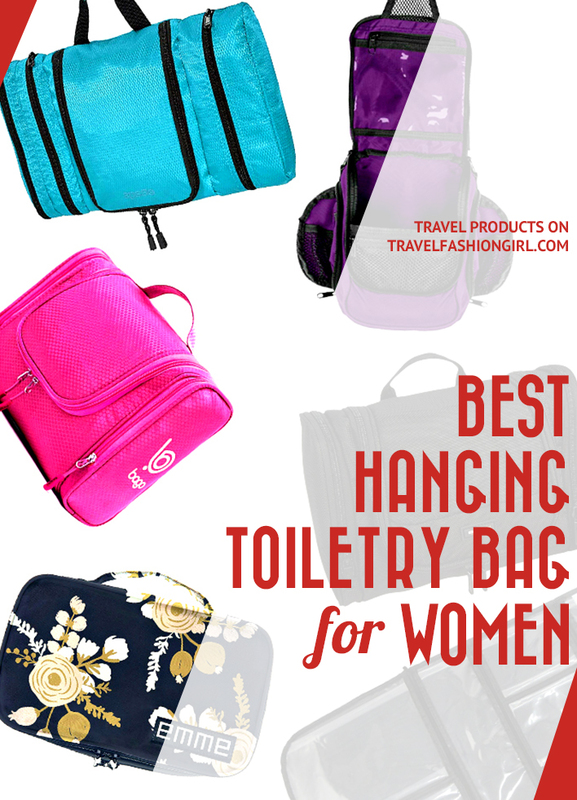 What's the Best Hanging Toiletry Bag for Women? Sometimes when you’re traveling, you don’t have enough counter space for a traditional travel toiletry bag, and that’s where hanging toiletry bags come in handy. We’ve compiled a list of the best hanging toiletry bags for women loved by TFG and our readers! How do I pack toiletries? How to save space and weight when packing toiletries? There are a ton of great travel toiletry bags available, but when you’re backpacking or opting to stay at hostels or other budget accommodations, you might not have as much counter space as you would like. If that’s the case, then a hanging toiletries bag is for you! Hanging toiletry bags are go-to for backpackers and travelers who are constantly on the go. Even if you’re staying at a five-star resort, you may prefer to keep your belongings in one of these handy bags. These toiletry bags have hooks, meaning you never have to worry about where to place your belongings. And you can easily re-pack in a moment’s notice — if you even unpack to start. The best hanging toiletry bag for women is one that lets you keep everything in its place, easy to see and get to, so all you need to do it close it and go! Convinced yet? Great! We’ve assembled a list of the best of the best when it comes to hanging travel toiletry bags, so you can pick out your favorite one! Packable is key for us here at TFG, and we love the eBags Pack-it Flat because not only is it packable, but it sits flat and has a ton of room! I love finding a bag that can fit a ton of product and not look it, and the eBags Pack-it Flat fits that bill. This hanging travel toiletry bag is great for over packers (we’re all guilty of it, yours truly included) but its slim design takes up no more room than a pair of jeans. As one of the TFG readers’ favorite toiletry bags, it contains four compartments to keep your essential beauty products organized and in place, saving you the chore of uprooting everything just to find your toothbrush. The bag has the option to expand, giving you an inch of extra storage space, too! Learn everything you need to know about packing toiletries in this ultimate guide! Does compact yet spacious sound your perfect hanging travel toiletry bag? Then the Sea to Summit TravellingLight kit is the one you’re looking for! This cute toiletry bag has zippered compartments at the top and has space near the bottom for larger items. And depending on the size of your larger, bulkier items, this bag can lie flat for easier packing. If you carry toiletries like disposable wipes on your travels, the zippered compartments are perfect for organizing your various products. This personal toiletry bag is cute, with its bright green color and compact design. Some travelers even call this the best hanging toiletry kit for women available. It is definitely a great choice if you’re stuck with limited counter space or you simply want to be more organized in your packing. Learn more packing tips with this guide! 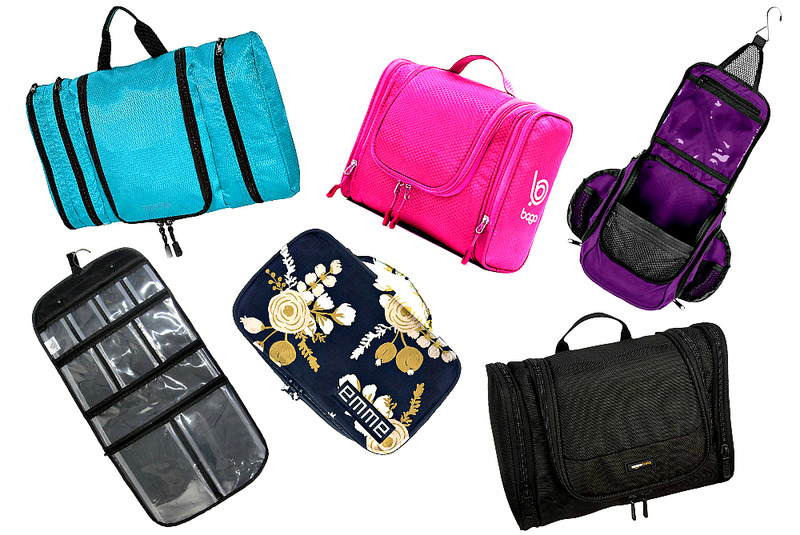 Looking for a great womens toiletry bag for your next business trip? Something basic and compact that will keep your personal toiletries organized? How about the AmazonBasics hanging toiletry bag? The AmazonBasic hanging toiletries bag is a great choice whether you’re packing for business trips, summer vacations, or out-of-town family holidays because of its slim form that holds way more toiletries than you think. This toiletry bag for women has ample space while still holding a slim, thin, packable shape. It’s space is more comparable to a large toiletries bag, yet it folds up flat, taking up about the same amount of space as a pair of jeans, perfect for space-saving placement in any suitcase or travel bag. You could even use this bag for your dorm room or simply while heading to the gym. Whatever your toiletry organization needs, you can get it done with the AmazonBasics. Read these beauty hacks to look good after a long-haul flight! Compact, lightweight and plenty of pockets? Where do I get one? The Neatpack Toiletry Bag is a small, packable choice for a personal organizer toiletry bag. The Neatpack simplifies travel toiletry organization by keeping toiletries organized and at your fingertips. You can hang it in your hotel room for fast access to personal items — no more rummaging to find what you need! It has an easy carry top handle, sturdy metal hook, an array of pocket and organization choices, quick-access side pockets, and durable water-resistant nylon fabric. Plus it has an array of cute color choices — whether you’re looking for a bold purple or red, royal blue, neutral forest green, or black graphite, this hanging toiletry bag has the shade for you! Hate having to scour through your suitcase to find your toothbrush or razor? 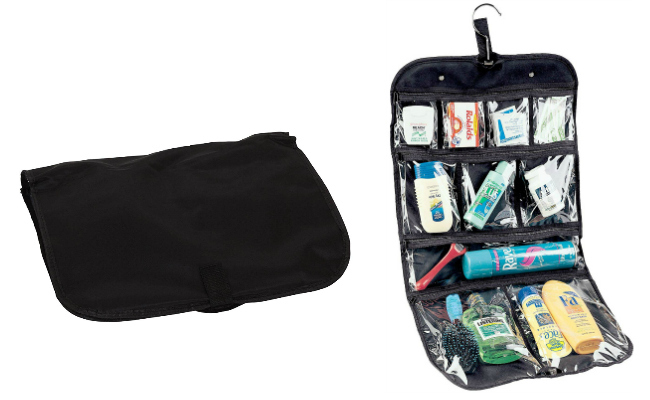 Take the hassle out of travel with the Neatpack Toiletry Bag. We’ve found the best electric toothbrush for travel! The Travel Companion will help make your travel a little less chaotic with pockets galorein a simple hanging travel toiletry bag. This is one of the best hanging toiletry bags, with 10 see-through compartments that let you store all of your toiletry needs in one location. No rifling through dark side pockets or cavernous single pocket totes necessary! With small, medium, and large pockets, this toiletry bag can hold anything you need it to and make it easy to find. You can hang it in a garment bag or on the towel bar, or you can fold it flat to stow it easily in your suitcase. With a secure closure and easy-to-clean lining and pockets, you are always ready to go and to look your best. So keep it together and get going! Read our guide to essential travel beauty products! 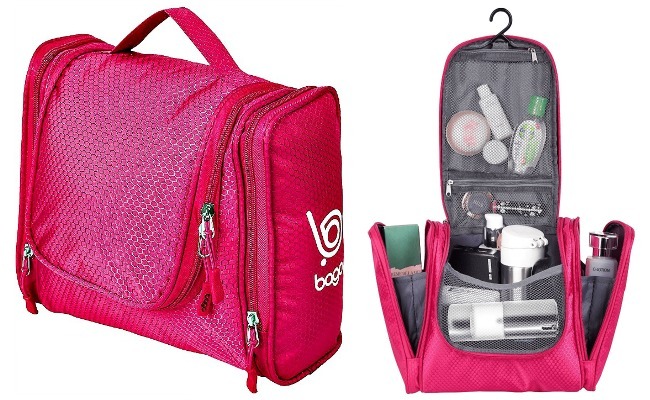 Ranking as one of the best toiletry bags for travel, the Bago hanging toiletry bag is ideal for those looking for the ability to carry a full range of beauty essentials and toiletries that’s still slim, compact, and packable. The Bago toiletry bag features nearly endless pockets and compartments so you can organize every product. 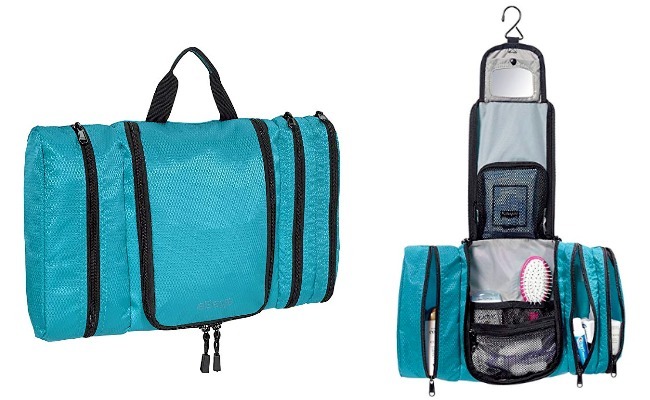 Along with two mesh pockets, this personal organizer toiletry bag has two side pockets for easy access, as well as multiple compartments within the bag to store smaller items. Made with a durable and lightweight Rip-Stop Honeycomb waterproof fabric, this bag will last years for traveling. We love the hot pink color, making it easy to spot among your travel partners and fun to unpack when you unzip your luggage! But it comes in three other adorable colors — purple, blue, and black. Check out these cute travel cosmetic bags! 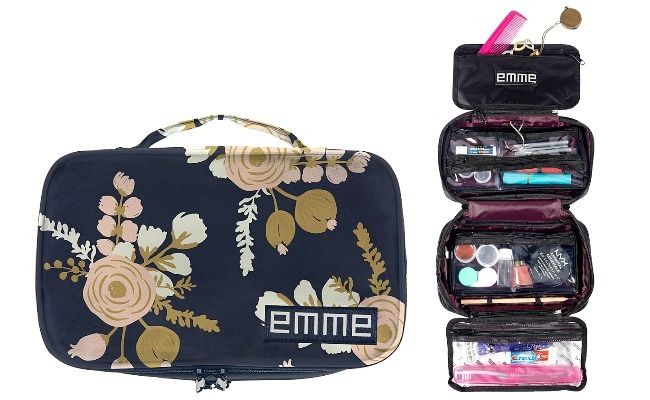 The Emme toiletries travel bag is designed to keep all of your toiletries together for vacations of any length. Perfect for organizing your essentials, the Emme women’s toiletry bag features a convenient carrying handle and a hook for hanging, along with removable pouches and a section of clear interior zipper pockets to keep everything in place. We love that this case is so compact and simple in its design, lending to its classic look. It has all of the essential without any unnecessary details. We list the travel size toiletries that are worth the money (and those that aren’t)! Looking for something that is travel-tough, water resistant, and TFG approved? 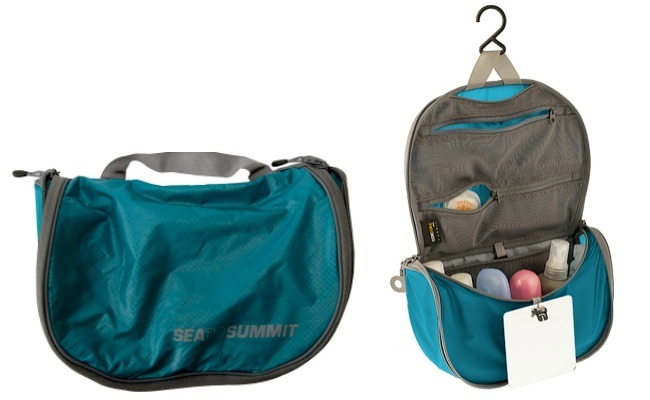 The LL Bean hanging toiletry bag is a classically organized toiletries bag. The LL Bean toiletry bag is full of compartments, not only for your toiletries, but other extras you might need for getting ready. This personal organizer toiletry bag is perfect for the traveler who needs to pack a few more products to keep comfortable. It is water-resistant, with multiple pockets for organization, and two zip pockets to keep your products and any accidental spills contained. And as an added bonus, this bag has a removable mirror to help you put on makeup when you don’t have access to the traditional set up. With additional pockets on the outside and side of the bag, it allows you to keep your different toiletry needs organized through your whole adventure! Oh, and there are plenty of colors for you to choose from — yellow, black, blue, teal, and more! Solid toiletries help you cut down on liquids in your carry-on! Be sure to read our complete guide to packing toiletries here. It walks you through, step by step, how to choose what to pack, how to downsize what you have, and how to pack it. In addition, watch this video to see how to pack your toiletries into your carry-on! Do a test run to see if everything fits in your toiletry bag. If your belongings don’t fit, consider using multi-use products such as a shampoo/conditioner combo, using conditioner as shaving cream, or baby shampoo for your hair and body. If you’ll be traveling for a longer time, you can buy toiletries at your destination. While these bags help minimize the bulk, you still need to keep in mind consolidating your toiletries into smaller containers so that they take up less space. Multi-use items are an essential space saver! Read these travel beauty hacks for more details. Choose appropriate travel containers. Many times, 3 oz bottles are too big for a one or two-week trip, so buy various sizes and take only the amount you will use. Instead of immediately buying “travel-size” containers in 3oz or 100ml bottles, get a range of sizes including 1oz, 2oz, and smaller jars like these, too. Tip: Replace glass containers with plastic to minimize weight and avoid breakage. Read this post on the best travel containers for more info! To ensure that you don’t forget to bring anything on your trip, we’ve created a helpful and very thorough printable toiletries checklist. You can click here or click the image below in order to open the editable file. 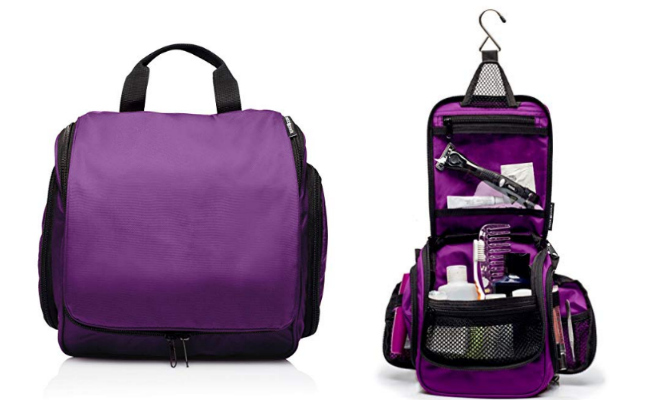 What do you think is the best hanging toiletry bag for women? Please comment below! Hope you liked this post about the best hanging toiletry bag for women. Please share with your friends on Facebook, Twitter, and Pinterest. Thanks for reading! I have the Samantha Brown Hanging Cosmetic Case/Organizer Item# 633830 that I bought on HSN to match my Samantha Brown Ombre luggage and my husband’s Samantha Brown Hardside luggage. Of all people, my husband loves, loves, loves it!!! He can finally find all our toiletries without having to rummage through the traditional toiletry bag we have used on all our past trip. Hi Arlene, thank you for sharing your review of your hanging toiletry bag, sounds awesome! Happy travels! I love the Briggs and Riley Transcend Toiletry bag. The bag has a nice box bottom to keep everything situated when hanging and also some extra pockets for smaller items and cosmetics. I like the fact that it is a buckle loop instead of just a hook so that you have more hanging options. Of course the lifetime warranty is a plus because this is an investment piece. Wow! Thanks for sharing Heather 🙂 It sounds awesome! With 2 little ladies, ages 11 & 13, any toiletry bag is simply a container to transport items – it never stays organized! As a result, we place all our items in an approved, clear bag (a.k.a. zip-lock or our ChicoBag ‘Travel Zip’) then, upon reaching our destination, I gather up available containers – glassware, mini trays, etc. – and organize the bathroom, not unlike our bathroom at home. It takes minimal effort, even for one night, but makes bed time & our morning routine so much simpler! This is a great tip Paige 🙂 Thanks for sharing! I love this list!! Just in time for my trip to Peru. Thanks! I was so excited to see you included the LL Bean hanging toiletry bag. I have used mine for over 2 decades. It’s very durable, just wipe with damp cloth if something gets on it. It’s big enough for my family’s items. 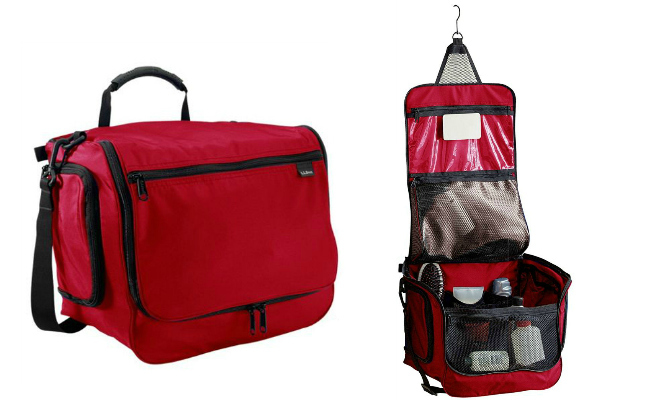 It has lots of storage, organizational pockets, even a clear plastic zipper pocket, the best part is the hanging hook. We camp a lot and most of the time there is no place to put your things. I can usually find somewhere to hang it and it’s off the ground and out of the way of others in a communal bathhouse. The only drawback is it does take up a lot of space in you travel bag (I use the matching LL Bean adventure duffle bag) if you are flying. Since I mostly do lots of car trips, I’m not as limited for space. It works great for me. When flying, I use a quart size, freezer bag for my 311 items, then incorporate back into my hanging bag. I’ve heard so many good things about this bag! I also still use a ziploc when traveling and insert it inside my toiletry bag afterwards. I try to avoid spills as much as possible. For something small to replace your ziploc bag, use a makeup bag with a handle. Easy! This doesn’t sound simple… But it is … And works well. I run a three bag system. 3. A hanging toilet bag … When in transit, this holds things like my hairbrush. Before entering the security zone, I open my bag… Open the toilet bag, and on top is the clear zip lock bag – and put it in the tray. When I get to the seat on my plane, I also remove the mesh bag, and put the clear bag and mesh bag in my seat pocket. (And my iPad and headphones)… Then the rest of my bag goes in the overhead locker. I have every thing I need to flight with me, and everything I don’t need in the over head locker. Next trip … Four weeks – and counting!!! Thanks for sharing your tips Kay!! That is a really great system! Glad you have found something that works so well for you! Thanks for reading and enjoy your trip! I have basically the same system! The 311 items are in a quart size baggie, which I keep handy in my backpack (I travel for work with a carry-on and backpack- backpack goes under the seat, suitcase in overhead). In other words, I’m not in and out of my suitcase- I put everything that has to go in a bin into my backpack so I’m only having to pull out from one place. I love my Rick Steves toiletry bag. It holds a lot, yet is flat and fills well in my carry on suitcase. He also sells, a small mesh insert with a hanger that fits flat in this bag. It is perfect for your small bottle of shampoo and bar of soap, to take into the shower and hang on the shower head, if there is no shelf in the shower. Perfect! 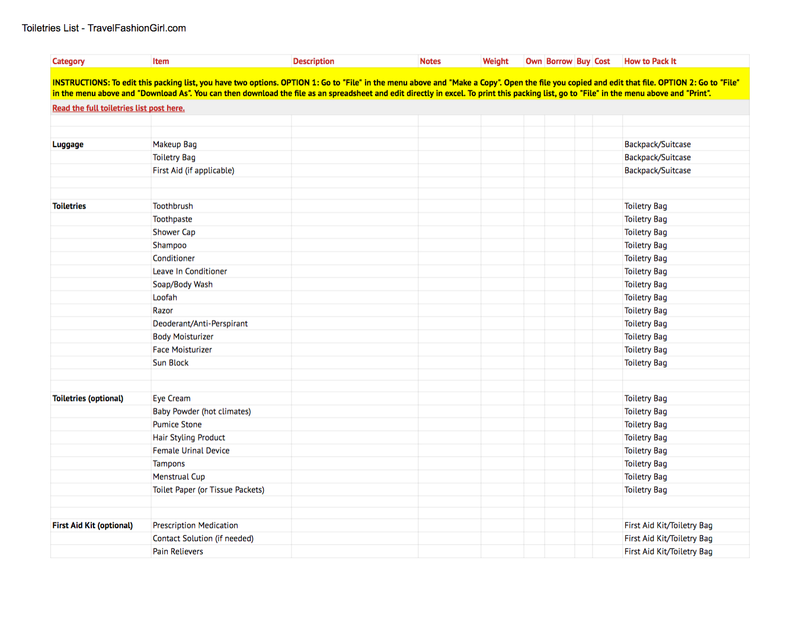 Super timely – you always seem to know what info I’m searching for next!